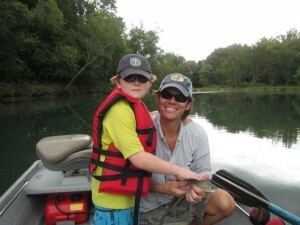 Bret is only seven years old and Saturday was his first fly fishing trip with his parents Christie and Chris from Little Rock. Bret worked hard on his roll casting but a drag free drift was just not a concept that registered. Although he did not actually catch a trout he did bring several to the net that Bo hooked up for him and he broke off a couple more that his Dad hooked for him. Nevertheless he had a great time running up and down the river in the jet boat. 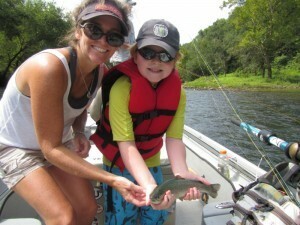 On the other hand, Bret’s Mom, Christie, who was a first time fly fisher, is just one of those “fishy people” and she caught here first Rainbow Trout on a fly along with a bunch of other fish on #14 RG/PT Cruisers, #16 Born’s Hairy legged Sowbug and #16 Tobe Flies. Bret’s Dad Chris has done some fly fishing and he stayed hooked up a good part of the afternoon. All in all it was just a fun family afternoon on the Little Red River. By the way, Christie owns a cupcake bakery in the Heights in Little Rock so check it out at http://www.eatacupcake.com/kavanaugh/contact-us/.